I know I do. And today, we have a plethora of vegan pizzerias (one of my favorites is from my old stomping grounds in Philadelphia, Blackbird Pizza). Right here in Sedona, we are so lucky to have Picazzo’s Healthy Italian Kitchen. They have a vegan-specific menu with lots of vegan pizzas. You also have the choice of their traditional crust, whole wheat crust, or gluten-free crust! I probably frequent them at least once every two weeks, no exaggeration. And they also have two locations in Phoenix. Oftentimes, non-veg pizzerias are now including vegan cheeses so that they can veganify any non-meat pizza. Viola! Of course, you can always dispense without the cheese; however, I must admit that although having done so, I feel as if something is missing. Many are even including gluten-free crusts as options. You can also buy some fairly decent gluten-free crusts in the freezer section of some grocery stores. Most grocery stores also have frozen pizza dough, often in both white flour and whole wheat flour. When you are working with fresh pizza dough, make sure you leave it out at room temperature for at least several hours. This will give the dough a chance to rest; and thus, the gluten will not be quite so feisty. But heck, if you’re going to be making your pizza at home, why not make your own dough out of double zero flour from Italy? Even if you think you are gluten intolerant, you probably won’t have an issue with flours from Italy because their grain is very, very different from our GMO, modified, processed flours. There’s a vast array of pizza dough recipes that you can get off the internet as they are most often vegan. When I make a batch, I’ll always double or triple it, then use fresh what I want, and freeze the rest of it in pre-portioned containers so I always have some at the ready. What’s the best beverage to have with your pizza? Well, for me, it is a great, chilled-glass of some sort of dark beer or ale. PETA – What Beers are Suitable for Vegans? With all the micro-breweries that are popping up everywhere, I’d suggest that you check them out. They typically sell take-home beer. I like to buy the dark-colored glass bottle growler size. I serve it when I’m entertaining, and then I use the rest in my culinary adventures. My favorite place in my neck of the woods is the Prescott Brewing Company. Their rich-hearty brew goes great as your beverage; but I have to admit that it is the only place that I buy my beer/ale for my Divinely Decadent Chocolate Stout Cake, whose original recipe is on my Veganification blog post of November 22, 2016. You can also find this amazing recipe in the Main Street Vegan Academy Cookbook. A hearty, dark ale or stout honestly makes all the difference in this cake! Okay, I’ve just digressed slightly. Back to the topic, Linda! Did you know that there is also quite a variety of gluten-free beers out there, many of which are vegan? 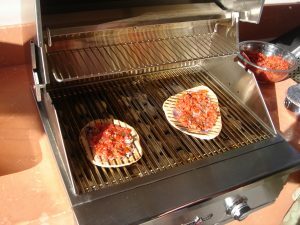 I recently purchased one for my recipe creation for one of the lunch offerings at the upcoming Sedona VegFest 2019, which is sponsored by Healthy World Sedona. Since the lunch offerings must be no-added oil, 100% plant-based, and gluten-free, I went on an exploration to find my favorite vegan, gluten-free beer. Well, I didn’t have to look far. I was able to find quite a variety at my local liquor store. 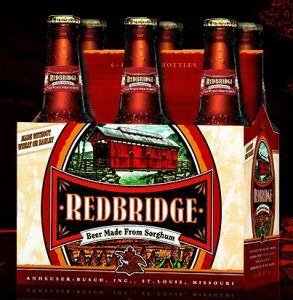 I ultimately landed with Redbridge Sourghum Lager. It’s slightly darker than a regular beer, so the added earthiness and nuttiness is perfect for my recipe. Bottom line for today—-Celebrate with friends, family, loved ones! Enjoy a slice (or maybe even two or three!) 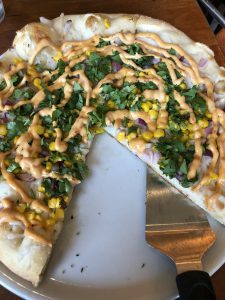 of delicious vegan pizza and wash it down with your favorite beer. But remember – Don’t Drink and Drive! Great recipe! I want to try this out! Thanks for sharing!